Stereotactic radiotherapy: a multidisciplinary approach. A network of experts to better manage modern technologies for the benefits of patients. The pivotal role of stereotactic body radiotherapy (SBRT) for a precise and localized treatment of neoplastic lesions, even in difficult-to-irradiate areas, and its interaction with other disciplines were the main topics of the 6th Annual Symposium of UPMC, entitled “The Role of Stereotactic Radiotherapy in Multidisciplinary Oncological Outpatient Clinics. ” The symposium took place on December 14 & 15, 2018 in the Via Veneto Auditorium, in Rome, and various professionals, including radiation therapists, oncologists, surgeons, and medical physicists attended it, taking advantage of the opportunity to compare their experiences with the latest developments in the field. A multidisciplinary approach, involvement of several professional roles, advanced technologies, association of different treatments, and a special attention to patients are all key features upon which to build the best care, especially in oncology. The first session was opened by Prof. Giovanni Vizzini, COO of UPMC Italy and Medical and Scientific Director of UPMC | Salvator Mundi International Hospital, who after a brief presentation on the UPMC group, launched the idea of creating a network of oncology centers, stretching from the U.S. to Italy, and with its base in the UPMC San Pietro FBF radiotherapy center and UPMC | Salvator Mundi (Rome). “Patients are at the core of our work, with their set of values and experiences, in a context characterized by high-performing technologies and ever-more targeted treatments,” he said. Thanks to the contributions from numerous expert speakers from important Italian, Portuguese, and U.S. centers, the symposium addressed the topic of treating neoplastic lesions located in different body districts, such as the brain, abdomen, thorax, and pelvis. During the two-day event, the strengths of stereotactic radiation therapy were analyzed: low toxicity-rates and the reduced length of treatment, as well as the importance of launching programs of immuno-oncology. 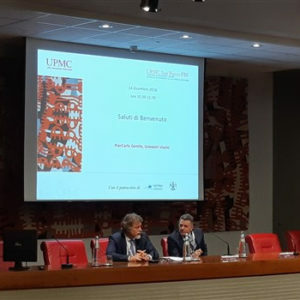 “Modern and high technologies must benefit patients,” said Prof. Vincenzo Valentini, head of the Radiation Oncology Department of the IRCCS – Fondazione Policlinico Universitario Agostino Gemelli. In the era of apps, computer networks, and database system interconnections there is a redundancy of data, which must be analyzed in-depth, managed, and adapted to each patient. “Today, knowledge has become IT-based. Provided that each symptom can be related to different pathologies, based on which different diagnoses can be made and knowledge modelled, there is a need to group them together. By linking and harmonizing each variable, we add value to the system,” he said.